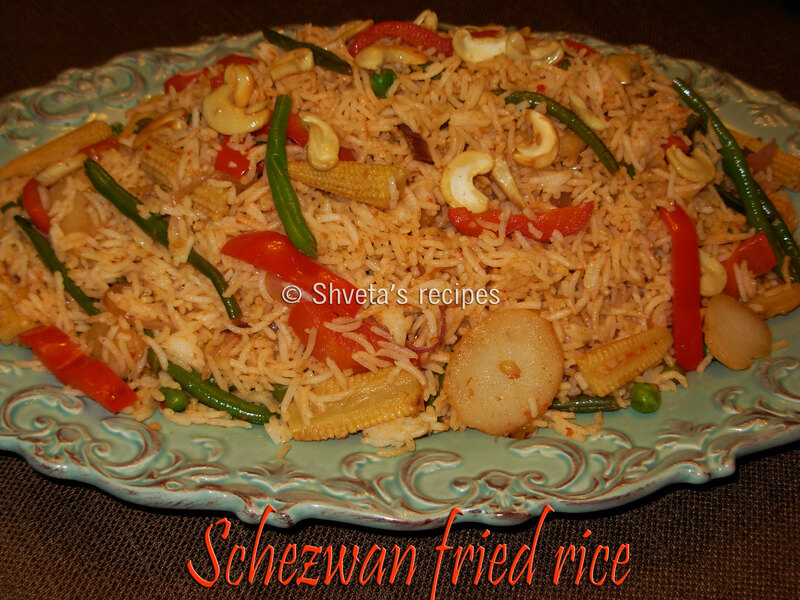 Schezwan fried rice is part of Chinese cuisine. Schezwan sauce has distinct red chili and garlic flavor. Schezwan sauce is easily available at any Asian grocery store. 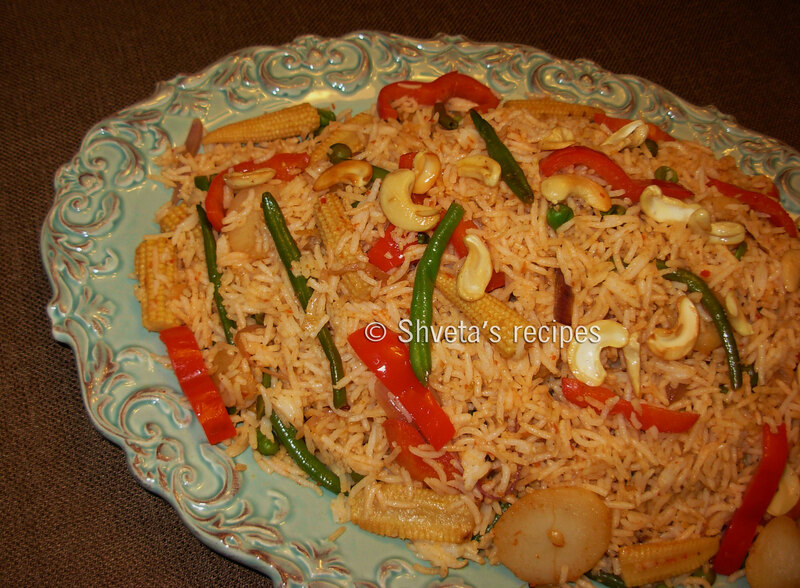 When rice is tossed in fresh vegetables and schezwan sauce, it gets a unique spicy and tangy flavor. Enjoy this easy to follow recipe. In a wok or big non-stick pan, heat olive oil on medium-hot flame. Add onions, water chestnuts, green beans, baby corns, mushrooms and in the very end red bell pepper. Toss together for 2-3 minutes on high heat. Now add cashews. The vegetables should be crunchy so we keep just cook, till its half done. Add schezwan sauce, rice vinegar, cooked rice and salt. Add spring onion leaves and toss well. 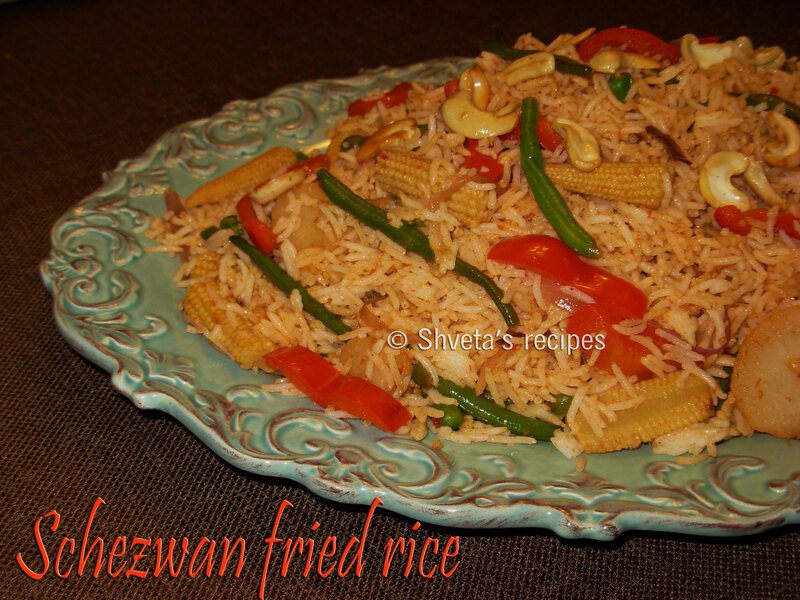 Cook for 3-4 minutes and schezwan fried rice is ready to be served. Garnish with fresh spring onions and cashews. Serve hot. 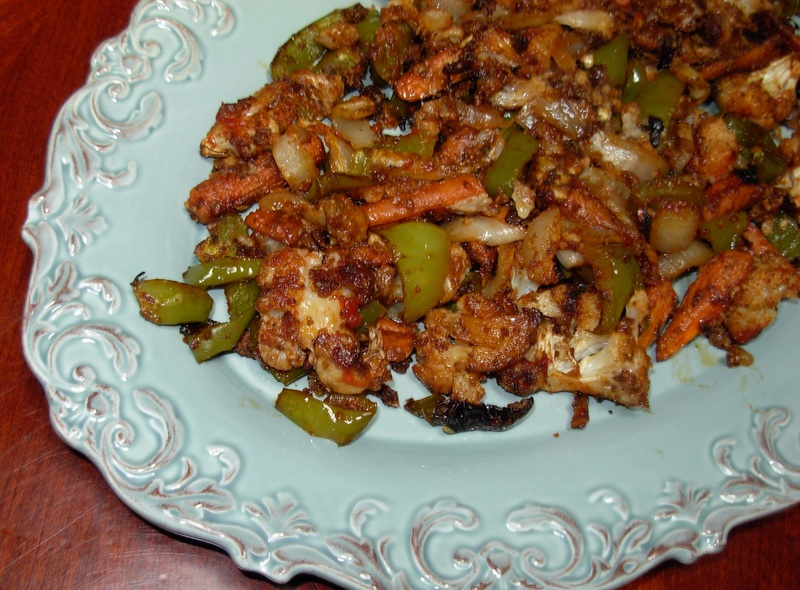 This is a simple healthy recipe to eat all the vegetables of our choice. I make it for lunch and have it with a hot cup of tomato soup. You can substitute any vegetable with your own choice of veggie. It is not just the feast for your taste buds, but a feast for your eyes too! Rinse and prepare all the vegetables as directed. Keep aside. Line a baking tray with aluminum foil. In a large bowl, add all the vegetables, red chili powder, lemon juice and salt. Mix well. Arrange all the veggies with the spices on the lined baking tray. Drizzle 1 tbsp olive oil. Bake in the oven for 20 minutes. Take out the vegetable tray from the oven. Move the vegetables around, to get evenly baked from all the sides, and put it back in the oven for further 10 minutes on 400 degrees. 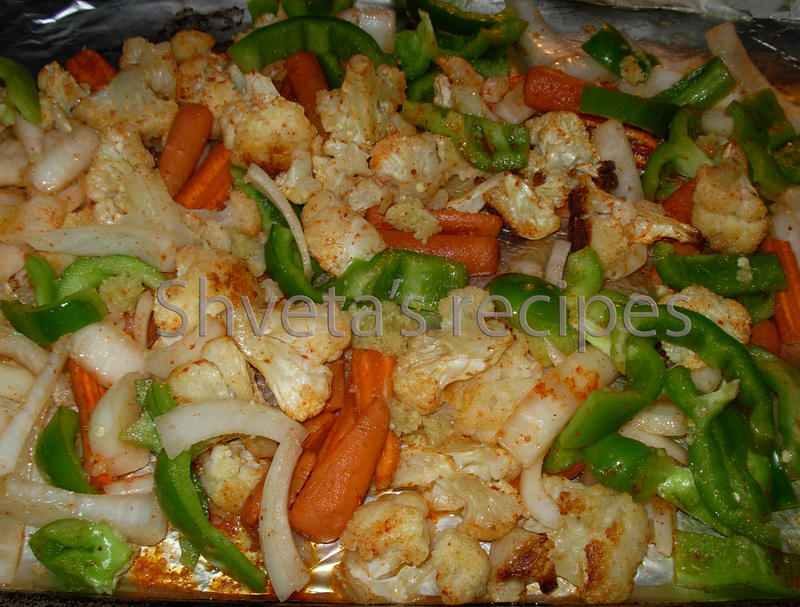 Remove the tray from the oven and in a bowl add grilled vegetables, Maggie hot & sweet ketchup and chaat masala. Colored grilled vegetable are ready to serve. I was thrilled to see these gorgeous long green chilies at our local Indian store. I immediately thought about my next recipe for the blog. After a long time, I have tasted these bharwan mirch. And it was truly awesome. So how can I not share the recipe with you? Hope you enjoy it as I did. Wash and dry green mirch. Make a slit lengthwise in the mirch and remove all the seeds. Boil and peel potatoes and keep aside. In a pan heat 2 tbsp oil. Add cumin seeds, mustard seeds and asafoetida powder. When it crackles, add boiled potatoes and mash it. Sauté for another 2-3 minutes mix well and cover the pan with the lid. Turn the heat to medium-low for 2 minutes. Add one spoon at a time besan to the potatoes and mix well. After adding all the besan to the pan, cover it for 4-5 minutes to cook the besan thoroughly. Add all dry spices (turmeric powder, red chili powder, coriander powder, garam masala powder, amchur powder and salt). Mix well and cook for a minute. Stuffing is ready. Take the stuffing off the flame and cool it down. Preheat oven at 375 degrees for bake. 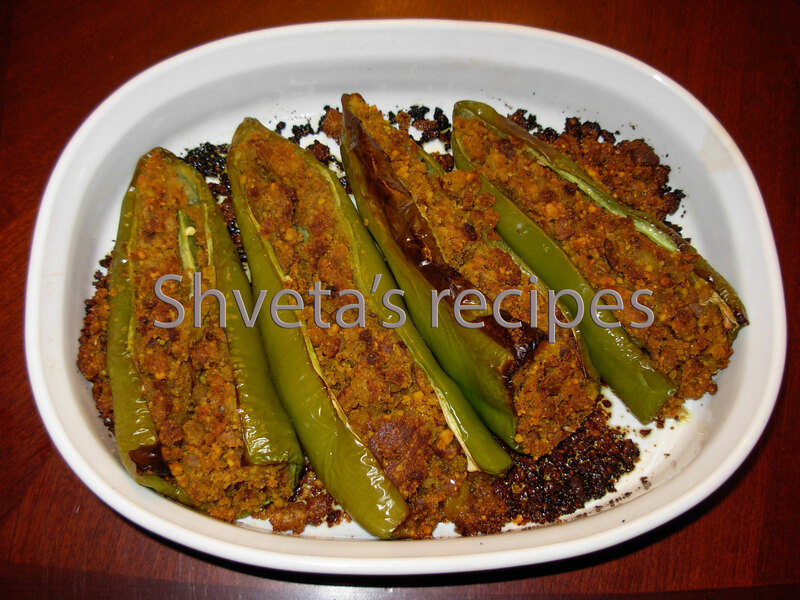 With the help of dry spoon fill up the mirch with stuffing. 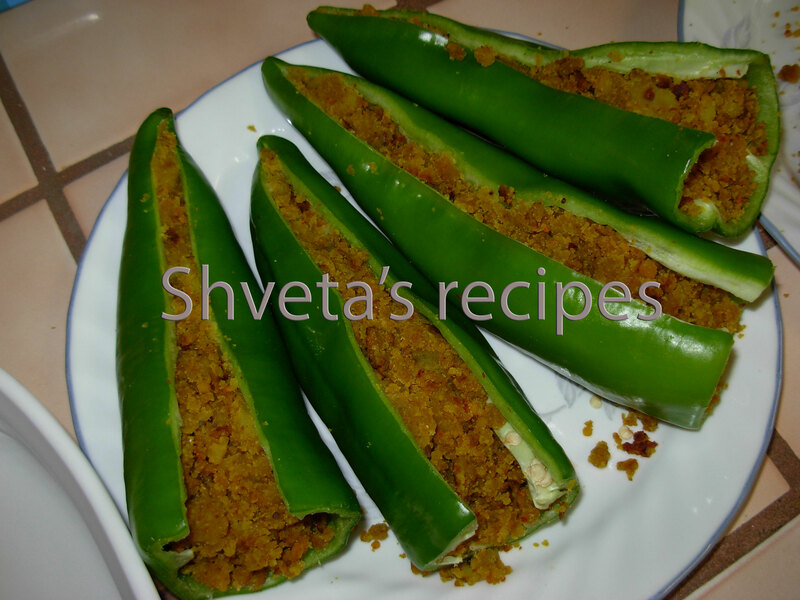 Arrange stuffed mirch in an oven proof shallow pan, drizzle 1 tbsp vegetable oil and bake it in the oven for 15 minutes. Keep checking few times. Once done, enjoy with fresh roti or paratha. Simply flavorful and yummy Indo-Chinese entrée. My son, Sohum’s all time favorite food. This recipe calls for some heat, which adds the unique flavor to the recipe. So don’t worry and try it 🙂 . Cut paneer into thick long strips. Keep aside. In a bowl take corn flour; add Maida, a pinch of black pepper and salt. Add water and make a runny batter. Heat 2 tbsp of oil in the pan. Cover the paneer cubes in the above batter and fry it. Towel-dry the fried paneer pieces and keep aside. Heat 1 tbsp of oil in the pan. Add minced ginger-garlic to it. Sauté for a minute. 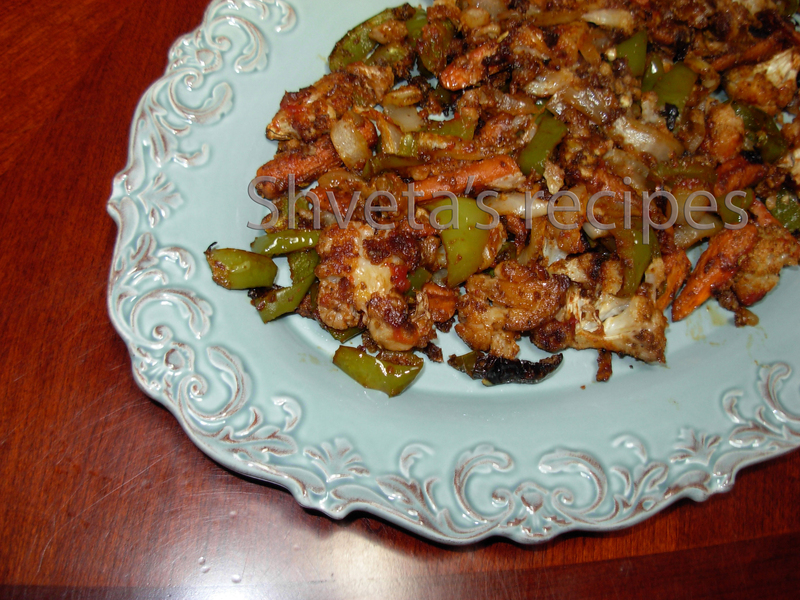 Add onions, bell pepper and fried paneer. Stir fry on high heat for 2 minutes. Add soy sauce, Hot & sour sauce, Garlic chili sauce, Maggi hot and sweet sauce, sugar and salt. Keep stirring for couple of minutes. Garnish Chili Paneer with cut spring onions and serve hot. Enjoy with hot steamed basmati rice or sticky rice. Note: You can increase or decrease the amount of sauces according to your taste.